SAN DIEGO, CA – June 8, 2018 – Festival organizers of the GI Film Festival San Diego have selected the 2018 Marvel Studios’ blockbuster film “Black Panther” for its upcoming Family Movie Night on Friday, Aug. 24 aboard the USS Midway Museum in San Diego Harbor. Guests can begin boarding for their journey to Wakanda at 6:30 p.m., and the film starts at 7:45 p.m. This year, the Family Movie Night takes place in advance of the GI Film Festival San Diego, Sept. 25-30, 2018. The annual event celebrates military-connected families and provides a fun evening out to celebrate the unofficial end of summer. Tickets to this special screening of “Black Panther” will be available to the public on July 5 on the GI Film Festival San Diego website at GIFilmFestivalSD.org. Pre-show activities will take place in the museum’s hanger bay and will include music, red carpet photo opportunities, resource tables and giveaways from military-connected organizations, and more. Concessions will be available for purchase. Festival organizers are working with partner organizations to provide complimentary tickets to local military families. For the first time, the GI Film Festival San Diego will conduct a back-to-school drive in collaboration with SAY San Diego at the Family Movie Night event. Attendees are encouraged to be a hero and bring donations that will set military youth up for academic success. Suggested donations for the coming school year include new items and essentials like pens, pencils, notebooks, binders, and more. A complete list is available on the GI Film Festival San Diego website and below. All supplies donated at the event will go to local military-connected students and schools in need. Guests who bring a donated item will receive a voucher for complimentary popcorn. SAY San Diego’s back to school program provides more than 2,700 children and teens with school supplies year-round thanks to the support of local businesses, services groups, and community leaders. Countless San Diego youth – especially military family members who enroll mid-year – arrive at school without essential supplies because their families cannot afford them. After expenses like food, rent, clothing, and other necessities, struggling households can be left with nothing in their budgets for basic school supplies. JDog Junk removal, a veteran-owned company, will transport the donations from the event to SAY San Diego’s central location where school representatives can access and begin distributing to students on the first day of school, Monday Aug. 27. The schools benefiting from the drive are Hancock Elementary School (Tierrasanta/92124), Miller Elementary School(Tierrasanta/92124), Farb Middle School (Tierrasanta/92124), and Perry Elementary School (Paradise Hills/92139). Marvel Studios’ “Black Panther” follows T’Challa who, after the death of his father, the King of Wakanda, returns home to the isolated, technologically advanced African nation to succeed to the throne and take his rightful place as king. But when a powerful old enemy reappears, T’Challa’s mettle as king—and Black Panther—is tested when he is drawn into a formidable conflict that puts the fate of Wakanda and the entire world at risk. Faced with treachery and danger, the young king must rally his allies and release the full power of Black Panther to defeat his foes and secure the safety of his people and their way of life. “Black Panther” stars Chadwick Boseman, Michael B. Jordan, Lupita Nyong’o, Danai Gurira, Martin Freeman, Daniel Kaluuya, Letitia Wright, Winston Duke, with Angela Bassett, Forest Whitaker, and Andy Serkis. The film is directed by Ryan Coogler and produced by Kevin Feige. Rated PG-13. Founders of the GI Film Festival announced in May 2018 that San Diego will now be the home of the national film festival for 2018. According to actor and renowned military philanthropist Gary Sinise, the festival is “the go-to place for military-themed movies.” The shift to the West Coast is a natural one for the national GI Film Festival, which launched in Washington, DC in 2007. San Diego boasts one of the largest military populations in the U.S., with seven major military bases between the Navy, Marines and the Coast Guard. San Diego County has the third largest veteran population in the U.S. with more than 240,000 veterans and more than 100,000 active duty members. San Diego is also the home to a thriving film and media production industry and dozens of film festivals year-round. Later this summer, GI Film Festival San Diego organizers will announce the full 2018 schedule, ticket prices, and venues. Many of the events will be open to the public with discounted opportunities for active duty personnel and veterans. Additional information is available at GIFilmFestivalSD.org. Established in 2015, the GI Film Festival San Diego is one of only a few in the entire United States to exclusively feature stories for, by, and about military service members and veterans. The festival highlights stories of heroism, resilience, and honor through compelling and authentic storytelling. 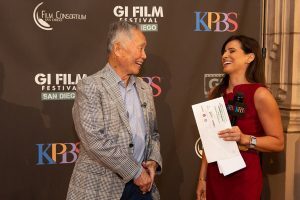 GI Film Festival San Diego is organized by KPBS in partnership with the GI Film Group and Film Consortium San Diego. Official sponsors of the 2018 GI Film Festival San Diego include Kaminskiy Design & Remodeling, The Super Dentists, TriWest Healthcare Alliance, BAE Systems, Lewis University, National City Mile of Cars, Altus Schools, and Bob Baker Subaru. Additional support is provided by Scatena Daniels Communications. The GI Film Festival San Diego is a proud member of the San Diego Veterans Coalition. SAY San Diego is a multi-service agency that has been advancing our vision of opportunity, equity and well-being for all San Diegans since 1971. We touch 50,000 lives annually by partnering with youth, adults, families and communities to reach their full potential through more than 30 programs. We enrich youth through before and after school programs at more than 40 sites. We strengthen families through parenting support, mental health counseling, child abuse prevention, juvenile delinquency prevention, self-sufficiency, and more. We engage communities by increasing resident involvement in solutions and offering services tailored to diverse needs through multi-service resource centers. JDog Junk Removal is a veteran and family owned and operated junk removal and hauling, small business. They empower veterans by serving the community, while protecting the environment. JDog does not go straight to the landfill after they remove items from your home; instead they find soldiers that are transitioning, or a once homeless person that is in need of some household goods, and repurpose most of the items that they pick up by gifting it to a person in need.